Summary: Act I: Every morning, Lucy the dog awakens in the alley where she’s spent the night, and goes to wait on the front doorstep of a certain house. Every morning, Eleanor, the little girl who lives in the house, prepares a treat and hangs it out the window on a string. Every morning, Sam, Eleanor’s father, juggles a few items, then heads out to his job at the grocery store. 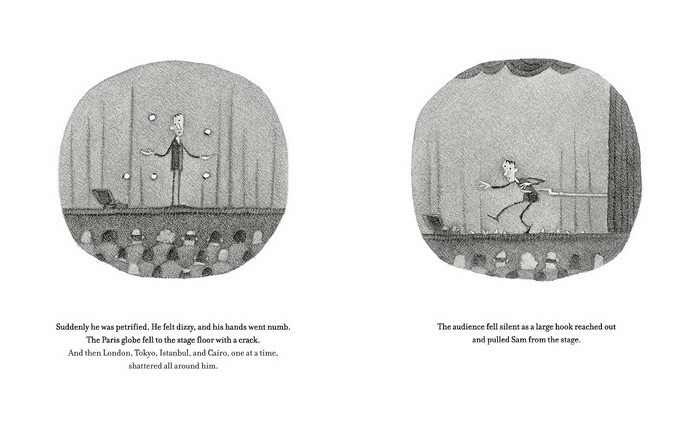 Every evening, Sam tries to juggle onstage, gets stage fright, and is pulled off with a giant hook. This pattern repeats in the second section of the book, Act II. But in Act III, some changes are afoot. As Lucy becomes more and more a part of Eleanor’s life, she is able to help Sam overcome his anxiety, and to gradually show the world his juggling talent. In Act IV, only two pages long, Sam juggles for Eleanor and Lucy, now a firmly established member of the family. 144 pages; ages 4-8. Pros: This may be the sweetest story of 2016 thus far. Perfectly illustrated with small gray-toned pictures, Lucy and Eleanor’s tale will capture the hearts of young and old alike. Cons: At 144 pages, this book bends the picture book rules. Librarians may be scratching their heads about where to shelve it.